This morning’s Google for “‘Michael Bloomberg’ president” (source for mm056 below) turned up this New York Magazine story several listings down. Take a deep breath; it’s quite long (and my blogging experts in the audience doubtlessly would have me format it or arrange it [linking to a separate page perhaps] differently. I’m a newbie, deal with it! ), but worth the trip, I think. No such thing as too much information, if we’re considering a person for elective high office. The Bloomberg-for-president scenario starts with the mayor’s growing sense of himself as a man of destiny. Throw in the country’s disgust with the two parties, add a half-a-billion bucks, and you’ve got yourself a race. Soon enough, From found himself having supper at Steinhardt’s apartment on the Upper East Side with Bloomberg and his senior political adjutants: deputy mayors Patti Harris, Kevin Sheekey, and Ed Skyler. For the next couple of hours, From laid out his analysis of the political landscape and his views on the viability of an independent candidacy. He discussed DLC poll data concerning the alienation of voters from the two major parties. But he also argued that any mayor—and especially a mayor of New York—would face an uphill slog. Bloomberg listened closely but asked few questions, preferring to hold forth (at great length) about his record as mayor. Regarding his national aspirations, he adopted a posture of self-protective self-deprecation. “What chance does a five-foot-seven billionaire Jew who’s divorced really have of becoming president?” he asked. Until last week, when the furor over the Queens police shooting erupted, Michael Bloomberg, 64, was having a nearly perfect year. His approval numbers, which in 2003 fell to 24 percent, had been above 70 precent since January. By taking visible and voluble positions on issues from guns to immigration to stem-cell research, he’d started to carve out a national profile. In a poll released last week rating the likability of twenty big-name pols, Bloomberg ranked seventh, behind Rudy Giuliani, Barack Obama, and John McCain but ahead of John Edwards, Hillary Clinton, Al Gore, and (obviously) George W. Bush. And although the racial tensions now simmering in the city suggest that Bloomberg will be on the hot seat for weeks to come, there’s a reasonable chance that his handling of the crisis—conciliatory, consultative, built on a history of fair dealing with New York’s black leadership—may actually redound to his benefit. Actually, you can—unless there’s a chance that you’ll do the opposite. Long before Bloomberg occupied City Hall, his ambition, energy, and ego were nearly limitless, and his success as mayor has enlarged them exponentially. Today, he seems to view himself as a man of destiny, whose wealth and wisdom empower him to transform not just the city but the country and even the world. Now he faces a fateful choice: between the well-trod, comforting, ennobling path of philanthropy and something far more exciting, grandiose—and arguably quite absurd. It’s the Tuesday after Labor Day, and Bloomberg and I are having lunch (though his idea of lunch is coffee and a slice of incinerated toast) at a diner in Tribeca. Bloomberg is dressed in a charcoal suit, a pink pin-striped shirt, and a pale-blue tie patterned with tiny yellow snails. He’s telling me a story about what a fabulous time he had the day before at the West Indian–American Day parade in Brooklyn—but the real subject is the affection, nay the devotion, the city has come to feel for him. As a steady stream of well-wishers stop by to shake his hand, Bloomberg revels in the transformation of his standing in the city. 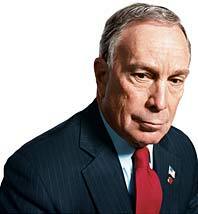 In his 1997 autobiography, Bloomberg by Bloomberg, he announced his belief that he’d make a terrific mayor, governor, or president. And now that he’s demonstrated his capacity in the first of those offices, he says he’s even more certain that he could master the other two. “I know something about how to build constituencies in an independent way,” he says. “I know how to make decisions and stand up to the criticism every day.” So you think you’d make a good president? “The answer is yes,” he says. That Bloomberg got elected in the first place seems a historical accident. He had entered the race a political neophyte, and one whose switch from Democrat to Republican made him seem a naked opportunist. His gifts on the stump were minimal: He was brusque, infelicitous, maladroit, utterly unvisionary. But then, goes the conventional wisdom, came 9/11—and the mood of the electorate darkened. What voters wanted now was an equable hand to keep the economy afloat and the city from unraveling. Bloomberg has done much to enhance that perception over the past year. Since January, he has secured funding for the largest school-construction program in the city’s history. He unveiled a plan to build and maintain 165,000 units of affordable housing by 2013 and made headway on vast development projects in all five boroughs. The on-time high-school graduation rate was higher than it’s been in twenty years. The crime and unemployment rates have hit historic lows. Bestowing on Bloomberg all the credit for the city’s post-9/11 revival would be absurd—for much of it is being driven by broader economic and demographic forces over which he has no control. Nor is there unanimity that either Bloomberg or his record has been as stellar as his fans make out. The sense that New York has become a town where only the rich are comfortable is felt by more than a few of its residents. Many elements of his development agenda—Atlantic Yards in Brooklyn, the far West Side, Moynihan Station—have stirred opposition. His performance during this summer’s blackout in Queens, when he declared that the Con Ed CEO, Kevin Burke, “deserves a thanks from this city,” drew gales of derision. And now he is mired in what promises to be a protracted, emotional, racially charged debate over the behavior of the city’s police. During Bloomberg’s first term, he repeated ad nauseam that he was “not a politician.” Lately, however, the phrase has all but disappeared from his lexicon. Partly, probably, it’s a matter of his feeling that the point’s been made. But it’s also an admission of the obvious. After five years in office, Bloomberg has honed some serious political chops—and has started, in a fashion too garish for anyone to miss, taking his game to the next level. Bloomberg’s incursion into national affairs began with a flourish in March, when, in the span of three weeks, he waded into three contentious, headline-grabbing debates. On the fevered grandstanding in Washington over the Dubai ports deal: “What I don’t like is, all of a sudden it becomes the issue du jour and everybody’s rushing up there waving a flag, beating their chests.” On illegal immigrants: “We’re not going to deport 12 million people, so let’s stop this fiction; let’s give them permanent status.” On a gun bill before the House Judiciary Committee: “A god-awful piece of legislation.” Two months later, speaking at the Johns Hopkins University School of Medicine graduation, he attacked the politicization of science—from opposition to stem-cell research and congressional meddling in the Terri Schiavo case (“Was there anything more inappropriate?”) to the teaching of intelligent design (“creationism by another name”). Cynics will contend, not implausibly, that in supporting some of these folks, the mayor had ulterior motives. In helping McCaskill compete in a state crucial to Democratic hopes of retaking the Senate, he earned a valuable chit with Chuck Schumer. And Lieberman was in line to chair the Senate Committee on Homeland Security, a panel of no small importance to the city. Yet the common theme tying together Bloomberg’s national endeavors, on both politics and policy, is frustration with the failings, inanities, and depredations of the two major parties—perhaps even the two-party system. And here the mayor’s feelings seem profound and visceral, and also increasingly irrepressible. At an off-the-record lunch with a dozen brand-name CEOs on the day after the election, Bloomberg uncorked a withering indictment of the political class, Democrats and Republicans alike, slamming its members for pandering, myopia, and borderline corruption. He even singled out John McCain, whom he generally respects, for abandoning his position against ethanol subsidies as he prepares to curry favor in 2008 with Iowa caucusgoers. If Bloomberg’s riff rings familiar, it should—for it echoes unmistakably the Texan twang of H. Ross Perot. Perot was manifestly unhinged; Bloomberg, by all indications, is sane. And Bloomberg has none of Perot’s isolationist or nativist leanings. But in other ways, their similarities are striking: both arch-capitalists, self-made men, technocrats, moralists; both possessed of a belief that government ought to be run more like a business; both allergic to the cant and dogma inherent in professional politics. The day after Bloomberg’s reelection, Kevin Sheekey, his campaign manager, gave a TV interview. At 40, Sheekey is a character straight from central casting: If Karl Rove is (or was) the Architect, Sheekey is the Operator. Puckish, preppy, tousled, and inordinately caffeinated, he was born and bred in Washington and worked for years on Capitol Hill, establishing a rakish reputation. After rising to become Daniel Patrick Moynihan’s chief of staff, he was hired away by Bloomberg in 1997 to be Bloomberg LP’s chief lobbyist and has been with the mayor ever since. Now, appearing on NY1 News, he averred that a Bloomberg presidential bid was “not likely”—though no one had asked if it was. Bloomberg’s answer is reasoned, measured, and blessedly wink-free—but it’s also riddled with elisions and escape clauses wide enough to drive a Hummer through. For one thing, Bloomberg’s socially liberal positions would only be a problem if he were seeking the Republican nomination, an eventuality roughly as plausible as his becoming pope. And a Democratic candidacy is almost as unlikely. No, if Bloomberg were to enter the fray, it would be as an independent. Whether that happens will likely depend on two factors: who the two parties pick as their standard-bearers and the mood of the country. Bush’s longtime media guru, Mark McKinnon, who now advises McCain, contends that “if a year from now there hasn’t been much progress or bipartisanship, and if the primaries do what they often do and squeeze out the moderates, you’ll have an ideal situation for a third-party run.” Sheekey, in fact, has publicly laid out the most likely Bloomberg-friendly scenario: McCain is beaten by someone to his right (Mitt Romney, say) and the Democrats choose someone generally seen as unelectable (guess who?). Bloomberg being Bloomberg, his ultimate decision will be well considered and ruthlessly pragmatic. “When he ran for mayor, he had to have a clear path in his mind about how he could win,” says Cunningham. “There would have to be a combination of factors where he believes there’s a road map that gets him to 1600”—1600 Pennsylvania Avenue, that is. The biggest downside to starting late is that it makes it harder to get on the ballot in all 50 states. But here the putative Bloomberg campaign has been blessed by fate with a ready-made solution: Unity08, a grassroots outfit in Washington that intends to field a centrist presidential ticket (selected via an online convention in June 2008) and handle the ballot-access hassles. Though the group may sound a little sketchy, two of its prime movers are Doug Bailey, the Republican consultant who nearly engineered an upset win for Gerald Ford in 1976, and Hamilton Jordan, Jimmy Carter’s White House chief of staff. Sheekey, it turns out, has already met with Jordan. And Bailey is openly courting the mayor. “It’s in both our interests for him to seek the Unity08 nomination,” he says, audibly salivating. What kind of campaign would Sheekey run? He isn’t saying. But judging from the one he devised for Bloomberg in 2005, it would be extremely sophisticated. Schoen points out that Bloomberg’s operation in 2001 was ahead of the Bush team’s now-famous use in 2004 of microtargeting—the new political science of combining consumer-database information with voter rolls to target people likely to be receptive to your message. And in 2005, Sheekey cranked up the tactic up another notch. In both elections, the Bloomberg campaign applied new technology, plus a boatload of cash, to the task of identifying and turning out independent and unenrolled voters. Hence the model that Sheekey would surely try to duplicate on a national scale. Nor is it clear that Bloomberg’s blend of social liberalism and fiscal conservatism is the electorally ideal admixture. Frank Luntz, the GOP pollster who advised Perot, tells me that Bloomberg’s showing in a recent survey he conducted—in the mid-twenties versus Clinton and a non- McCain, non-Giuliani Republican—meant the mayor was “ahead of where Perot was at this point in the 1992 cycle.” But though Perot’s voters still exist, Bloomberg’s stances on trade and immigration aren’t likely to entrance them. Then there’s Bloomberg’s total lack of national-security bona fides, not a trivial weakness in an age of terror. Maybe most problematic is the very quality that makes Bloomberg appealing to, well, many readers of this magazine: his brass-tacks managerialism. “Being able to get people into a room and work together is a wonderful thing when you’re governing,” says From. “But presidential campaigns tend to be ideological campaigns. Not necessarily in the gross sense of ideology, but you have to have ideas that cut with voters—they want to be inspired.” After all, the last presidential candidate who campaigned on “competence, not ideology” was Michael Dukakis. And we all know how that turned out. And that would be tragic? Bloomberg’s oratorical proficiency is often roundly mocked. (Given his relentless monotone, one of the more amusing experiences in rhetorical voyeurism is listening to him try to do justice to an exclamation point in his prepared text.) But Bloomberg’s speeches occasionally have passages that are working on a subtler level than you first imagine, and the above is an example. What he seems to be doing is mocking himself, poking fun at his own ego. But he’s also reminding his audience that he has been preaching the virtues of philanthropy since before Bill Gates, Warren Buffett, et al. made it fashionable. Bloomberg, to be fair, has been doing more than preaching; he’s been walking the walk. With donations of $144 million in 2005, he ranked seventh on this year’s Slate 60, just under David Rockefeller. And if he lives up to his word, his rank will almost certainly rise. Bloomberg says that he intends to give away most of his moola after he leaves office. To that end, he recently bought a $45 million building on East 78th Street near his home, out of which he and Patti Harris will run his foundation. You’re talking about merging your politics to your philanthropy, I say. I don’t feel like a wingnut (of course the oddballs never seem odd to themselves! ), And I’ve evolved beyond U—-8, but I’m thinking that there has to be room for this guy on the national stage. Help me find one! This entry was posted on Tuesday, July 10th, 2007 at 9:42 am and is filed under musings, Politics. You can follow any responses to this entry through the RSS 2.0 feed. You can leave a response, or trackback from your own site. Read the article was really useful and informative. Existence of such a blog and blog articles that had interested me. I will try to be your constant reader, thank you. man 3d is taking off. they now have touchable 3d and they are coming out with 3d screens that you dont require glasses for. crazy stuff. i still feel its a little bit of a gimmick though. i have read all of the harry potter books like FIVE times. and seen all the films twice that amount. I can not wait untill deathly hallows is released in theaters..
At 1st I was type of sceptically but small did I know that by the end of reading this entry I will shift my perspective 180 degrees. you’re eating them with the people you love. Some people even remodel their garages at the same time they build a pool. He frequented the nearby Audubon Society sanctuary in Sharon, where he took great interest in all the birds. hi… i did not agree with some of the things, nevertheless i do enjoyed the article in general… the article was actually proposed to me by a friend at digg and she was right. really good read! Take care! Generally I do not read post on blogs, however I wish to say that this write-up very pressured me to take a look at and do it! Your writing style has been amazed me. Thanks, very nice article.